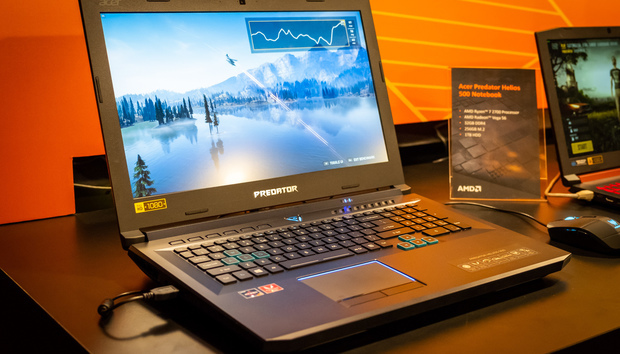 The new Acer Predator Helios 500 has enthusiasts of both Intel and AMD covered. That’s because you can now choose from the model shown here, which is built around an Intel CPU and Nvidia graphics, or go all AMD with the version you see at the top of this article. 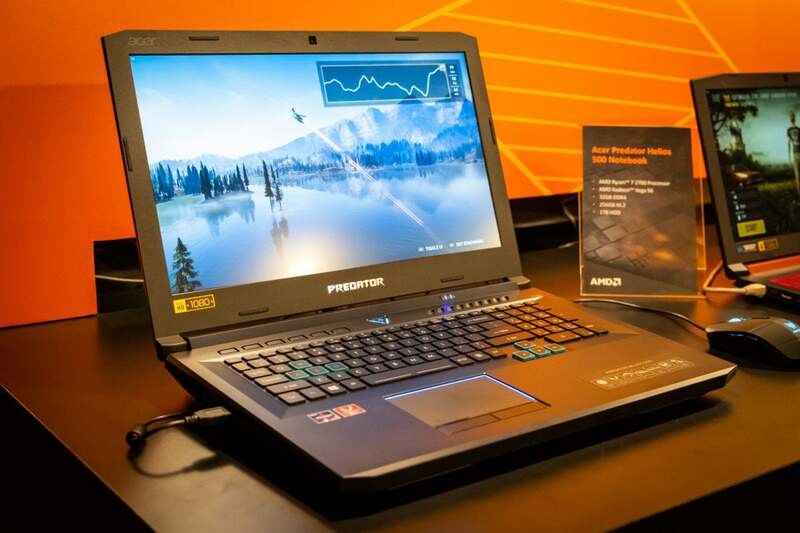 The AMD version of the Helios 500 features a 17-inch, 144Hz FreeSync Panel; 32GB of DDR4; a 256GB M.2 SSD; and 1TB HDD. And most importantly for AMD fans, it features an 8-core Ryzen 7 2700 and Radeon Vega 56 graphics. The CPU is the desktop Ryzen 7 2700. It’s an 8-core chip with SMT for 16-threads of computing power. It’s also likely the fastest CPU around for many multi-threaded loads. In Cinebench R15, for example, we saw the Helios 500 spit out a score of 1,512. As far as we’re concerned, the performance of the Radeon Vega 56 chip is even more interesting. We know from our review of the desktop part that it punches beyond its class, and likely caused Nvidia to release the GeForce GTX 1070 Ti in response. Although we thought the Radeon Vega 56 was a re-purposed desktop chip, we were told that, no, it’s a part that always been intended for mobile use. That tells us it may very well be the very first sighting of the Radeon RX Vega Mobile chip that AMD talked up at CES. Mind you, this is not the same graphics core used in Intel’s Kaby Lake G, that unprecedented Intel/AMD collaboration. As its name implies, the Radeon Vega 56 should be a full Vega 56 part. We only had one benchmark available to run, but it’s pretty modern—Ubisoft’s Far Cry 5. We set the laptop to 1920x1080, selected Ultra and also switched off FreeSync to prevent it from interfering with any results. We know public results of a desktop GeForce GTX 1060 6GB cards are in the 70 fps range and GeForce GTX 1070 cards sit in the 90 fps range. The Vega 56 in the Helios 500? It hit a pretty respectable 80 fps, but it’s still definitely short of a full desktop Vega 56, which actually pushes the 110 fps range in this game. Given the thermal limitations of laptops, we have to assume the chip in the Helio 500 is running the GPU at lower clock speeds. The last detail we’ll mention is the battery, a 74-watt hour cell. Like most desktop replacement gaming laptops with big screens and big GPUs and CPUs, we’d expect that you’d be lucky to get an hour under heavy loads. But that’s actually typical.